start the Taxi Mission, simply press ‘R3’ on your controller when in a cab. To pick someone up, simply look for a fare around you, which will be highlighted with a large yellow arrow hovering over someone in the street, and show up as a yellow blip on the map. Simply pull up close to them, and they will jump into the cab. You will then be told where your passenger wishes to be taken. Their destination will appear as a pink blip on the map, and show up as a pink marker at the actual location. When you arrive at the passengers destination, park up in the pink marker. The passenger will get out and pay you. Once you have completed a fair, look for the next in the same was as detailed above. 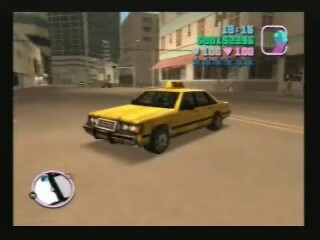 You are required to take 100 fares to complete the taxi mission, although you do not need to do these 100 in one go, as your fare count is recorded. You can stop the mission at any time, and pick up where you left off later in the game. If you get out of the taxi, or press the 'R3' button, the mission is cancelled. If you crash to many times and damage the car, passengers will not want to take a ride. If you drive carelessly, your passenger may jump out. Once completed, you will be able to use Hydraulics in the Taxi.